This announcement was a surprise because Elon Musk simply advised on social media that he’d communicate important news regarding SpaceX activities. Given the various projects under development in the aerospace company, many speculations were made in a few hours, and inevitably the hype was very high. In fact this is what could be a milestone for space tourism since humans will be sent into space, in this case even out of Earth’s orbit, in a private space travel. The big surprise is due to the fact that it’s a short-term project since the journey is planned for 2018 but that goes far beyond what has been done so far by SpaceX. 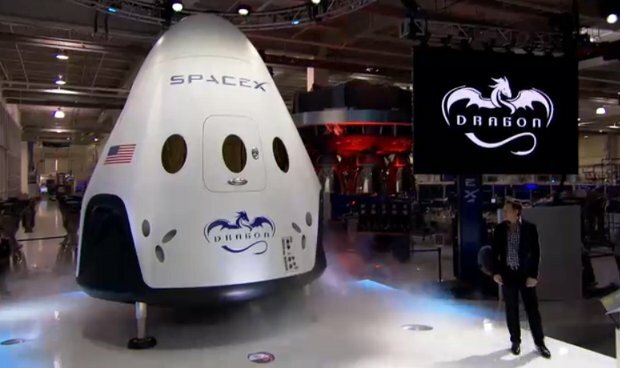 Currently Elon Musk’s company has a Dragon docked with the International Space Station but it’s the cargo version. The Dragon V2, also called Crew Dragon exactly because it will transport humans, was presented in 2014 but it’s still under development. SpaceX has also secured a contract with NASA to carry astronauts to the International Space Station and for their return to Earth, called Commercial Crew Program. The first flight of the Dragon V2 will be an automated test, basically like the cargo spacecraft, planned for this year. If all goes well in the second quarter of 2018 the first real crew transport to the Station should happen. At that point, SpaceX will proceed with the private journey around the Moon. For summer 2017 first launch of the Falcon Heavy carrier rocket is also scheduled. It’s essentially a version of the Falcon 9 launched with three first stages side by side that will land each on its own after accomplishing their task. The Falcon Heavy will develop about two-thirds the thrust of Saturn V, the rocket used to send astronauts to the Moon. Now NASA is in a curious situation because it’s planning a similar mission to send astronauts around the Moon on its Orion spacecraft launched on its Space Launch System (SLS), both in their development stage. SpaceX could succeed first in the deed at a much lower cost. If SpaceX succeeds in this deed it will also be thanks to NASA’s funding and in the press release the company explicitly thanked NASA for this reason. On the other hand, NASA is encouraging private initiatives precisely because they allow launches paid by others that may end up bring advantages in NASA projects as well. In short, between SpaceX and NASA’s there’s collaboration and competition at the same time. Officially, NASA issued a statement regarding the private Moon mission’s announcement in which praised SpaceX for reaching higher. The agency also stressed its investments in private industry and the possible developments for space exploration. Statements aside, what remains to be seen is if SpaceX can make this journey in the scheduled time. The development of both the Dragon V2 spacecraft that the Falcon Heavy rocket are late but from this point of view SpaceX is in good company because NASA is late in its programs too. However, something is moving in the field of space tourism, even if limited to the super-rich.